The United Nations (UN) Special Rapporteur David Kaye on freedom of opinion and expression is conducting a project on the “responsibilities of the Information and Communication Technologies (ICT) sector to protect and promote freedom of expression in the digital age”. The UN Special Rapporteur made a call for input to help him identify actors with the ability to impact freedom of expression, to point out to current legal issues and practices to resolve them. EDRi submitted a response to the questions asked by the rapporteur. What kind of “intermediaries” have the ability to impact freedom of expression? The answer is tricky, as any individual, legal entity, animals, robots, “connected things”… can have an impact on freedom of expression. In its submission to David Kaye’s call, EDRi focused on the list provided by Section 104 of the rejected Stop Online Piracy Act (SOPA), i.e. on traditional intermediaries, which range from payment providers, Internet search engines to domain name registrars. Despite being rejected, SOPA’s approach was broadly adopted by the US via “voluntary” agreements, which give rise to extraterritoriality, constitutionality, predictability and redress issues. What are the legal issues that may arise from intermediaries’ activities? One could write pages and pages about unfair contract terms, jurisdiction, applicable law, constitutional rights, human rights, fundamental freedoms, balance of corporate incentives, liability and “safe harbours”, “voluntary” or “self”-regulation. EDRi decided to concentrate its submission on some of the issues outlined by the UN Special Rapporteur himself. For instance, EDRi addressed problems related to transparency, content regulation, intermediary liability and balance of rights, political power of online companies, security and privacy, remedies and preventive measures. After our submission, there have been some instances that exemplify some of the issues outlined above. We’ll consider three. First, there are companies which can influence greatly your freedom of expression without even having a direct link to you. For example, if you run a start-up and your content is blocked under Facebook’s zero rating programme, Free Basics, and you don’t have the money to reach an agreement with Facebook, your freedom to impart information is quenched. The good news is that countries like India have banned these practices. Second, Paypal has unilaterally terminated UnoTelly’s account due to infringements of its vague terms of service, including alleged copyright violations. UnoTelly provides Virtual Private Networks (VPN) and SmartDNS tools which can be crucial to inter alia protect people’s privacy rights. 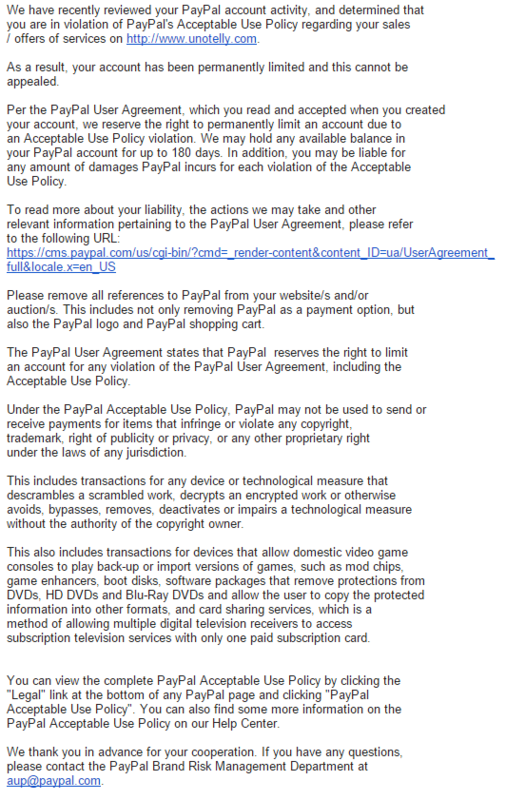 PayPal removed its services unilaterally, without warning UnoTelly or offering an appeal mechanism. The third example is a result of the European Commission’s launch on 3 December 2015 of the IT-Forum (PDF). Its purpose is to have a dialogue, i.e. to bully, Internet companies to “voluntarily” solve the complex issue of terrorism and the problem “hate speech”. It is no coincidence that companies like Google or Twitter have put out press releases communicating on their efforts to counter-terrorism online, which includes content take downs or suspension of accounts. This can lead to false positives, human errors and censorship. It can also be ineffective and have counter-productive effects. For instance, it is very easy to set up another account and publish the same content over an over again, leading to a Whac-A-Mole game that never stops – or lead to the victimisation, or perceived victimisation of ethnic or religious groups. In addition, what are the incentives for companies to act for the public good and why wouldn’t they use such activities also for their own political benefit? Whose responsibility is it if anything goes wrong? Are we sure we want companies to further arbitrarily manipulate discourse online? What about the evidence needed for law enforcement authorities? Is the aim to ensure that the law is enforced or for terms of service to be enforced? So what can you do to tackle those issues? enforceable obligations for companies to respect human rights online would be a suitable option. In June 2016, David Kaye will present a preliminary mapping report to the Human Rights Council. We are looking forward to it.